Are you ready for the most exciting, adrenaline filled fly fishing available in the Pacific Northwest? If so, this is the trip for you! A unique opportunity: Fish the Skeena for the biggest and strongest Steelhead on the planet during prime period. Simply put, British Columbia’s Skeena River is a super fish superhighway — a thoroughfare for the largest Salmon & Steelhead in the world. During fall the lower main channel of the Skeena hosts vast numbers of migrating Steelhead headed for numerous upriver tributaries. The Steelhead fishing on the Lower Skeena is unparalleled. Renowned rivers such as the Babine, Kispiox, Sustut, Bulkley, Morice, Copper and Kalum enter the Skeena above our camp and all fish bound for these rivers must pass directly in front of us before reaching their spawning grounds. Only a day or two out of the ocean, at the peak of their size, strength and beauty, these are among the biggest and most aggressive Steelhead on earth. To hook one of these fish on the fly in the broad Lower Skeena is to touch the heart of the wilderness - an experience not to be forgotten! 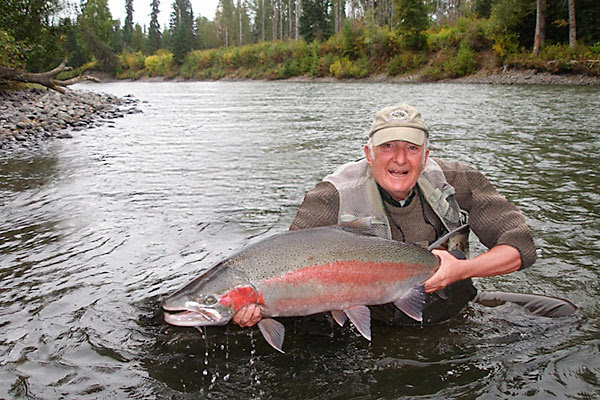 The scenery at Skeena is nothing short of spectacular - soaring, snow-capped mountains, a large wild river, numerous waterfalls and abundant wildlife are your backdrop as you cast for the Skeena’s legendary wild Steelhead. Many people believe that the Skeena watershed is easily accessible with easy-going fishing, but that is not the case if you want to get to the fish. Many of the best rivers and spots are more or less impossible to access without a guide, and the only way to get there is by powerful jet boat and local knowledge. Not for forget that some of the most attractive rivers or stretches are licensed with limited access for only a small number of people. Salmon Junkies has access to all classified water. To fish for fall Steelhead requires extremely talented guides who can manoeuvre and pick the right spots for any given time or situation. We dare to say that we have the best team of Steelhead guides and they are willing to share their deepest secrets by leading you to the fish. Great fly water, aggressive fish, abundant wildlife and spectacular scenery make for a great wilderness experience. If you need another satisfying dose of the good stuff, I encourage you to join our groups. The landscape, the people, the wildlife, and of course the fishing, make for an unforgettable and consistently remarkable experience. As your host, I'll do my best to guarantee you have the best trip possible. Feel free to consult with me any time.